He knows he's the hundredth director to rip off E.T. : he's just going to do it better, and with jokes fit for a vintage Warner Brothers cartoon. 89 min. Sony Pictures Classics. Director: Stephen Chow. Cast: Stephen Chow, Xu Jiao, Tin Kai-man, Chan Kwok Kwan, Lee Sheung Ching. The bighearted feel-good family science-fiction comedy CJ7 doesn't hide that it's ripping off the basic plot and emotional beats of E.T. Normally, this sort of thing would really bug me, but the producer, director and co-writer is Stephen Chow, the irrepressible creator of Shaolin Soccer and Kung Fu Hustle. He knows he's the hundreth director to rip off E.T. : he's just going to do it better, and with jokes fit for a vintage Warner Brothers cartoon. Elliott was middle-class, but Dicky Chau (Xu Jiao) has it worse. His father Ti (Chow), a construction worker, has to scrounge dumps to get Dicky shoes (when stitching up Dicky's current ones isn't enough). They can only afford rotten apples. Father and son's after-dinner pastime is squashing cockroaches in their overheated, run-down apartment. The class consciousness comes into relief when Dicky's in school. "I want to be a superstar," says one classmate. "I want to be an entrepeneur," says another. "I want to be a poor person," says Dicky, only to be met by derisive laughter. Dicky's Christ-like announcement descends from his father's belief in purity of character, but Dicky isn't a saint. He's a boy, and he's had enough of being bullied, being dirty, and doing without the new shoes and cool toys of his classmates. With his mother dead and his father expecting academic greatness, life at home doesn't seem so hot either. Chow and Jiao conspire to make Dicky a realistically petulant child hero, whose journey takes him back to gratitude for what he has (another key lesson: study hard!). The vehicle for Dicky's change arrives following an incident inspired by Chow's own childhood. It's a universal moment: in a toy store, Dicky throws a tantrum when he can't have the CJ1, a robot dog. He says he won't leave without it, but Ti strikes his son and hauls him out of the store. Brokenhearted, Ti goes to the dump to get Dicky sneakers for PE. He finds them, but he also spots an unusual green rubber ball, and brings it home to Dicky as a peace offering. Everything changes when the ball opens up to reveal "an alien toy dog," a green beastie with a furry beige head and an antenna. Dicky's never seen anything like it: perfect! And he shall call it CJ7! Like E.T., CJ7 has powers, the nature of which I won't reveal. But they pay big comic dividends and play into the inevitably melodramatic ending. The film largely succeeds on Chow's comic timing and playful attitude, but perfect casting helps. Chow makes the unusual choice of casting a girl to play Dicky, and Jiao not only carries off the illusion but turns in a very funny and charming performance (best moment: Dicky's silent scream when under orders to be quiet). For the role of Maggie, the giant-sized girl with a crush on Dicky (the ground trembles when she walks), Chow cast a young male professional weightlifter and dubbed a dainty girls' voice over him. The pint-sized corporate-minded bully that torments Dicky is aces, as well, Kitty Zhang Yugi is sweet as caring teacher Miss Yuen, and Chow effortlessly handles the comedy and drama inherent in the role of Ti. Chow has a finely tuned sense of humor, and at least for this picture, he's learned to bend it like Robert Rodriguez, with a bunch of nifty (though glaringly obvious) CGI effects; the best of these spoof other action films, including Shaolin Soccer. Despite a couple of brief, hyperbolic fights, this isn't a fight picture. Striking out into family-film territory, Chow has just as much winking fun as he ever did. He sets the tone with Gazebo's '80s disco cut "Masterpiece," but the picture is better described by another song used twice: "Sunny." 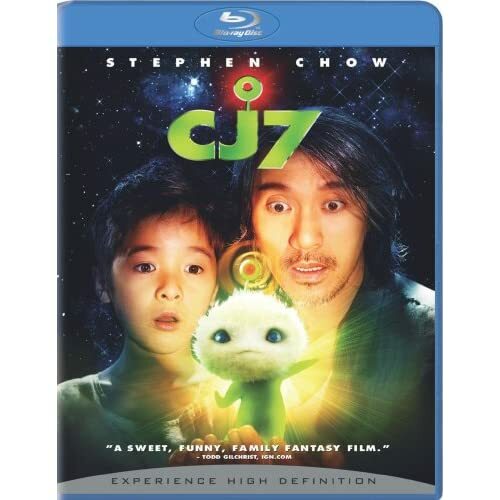 Sony's special edition of CJ7 is, like the film, pleasingly eccentric. The flawless transfer and lossless audio allow this new film to shine, and it's surrounded by a grab bag of interesting bonus features. One can watch the feature in its original Cantonese, or with dubbed Mandarin or English tracks (of course, subtitles are available for all). First up is a subtitled cast & crew commentary with Stephen Chow, Chi Chung Lam (a.k.a. "Fatso" Chung), Shing-Cheung Lee, and writers Lam Fung and Kan-Cheung Tsang. It's a lighthearted and collegial track; though unfocused, the commentary does get into the underpinnings of some of Chow's choices, including the unusual casting, feelings about the Mandarin dub of the film, and some of the production challenges of shooting CJ7. "The Story of CJ7" (13:41) includes interviews with Chow, producer/writer Vincent Kok, and star Xu Jiao that give an overview of the film's inspiration and making. "CJ7 Television Special" (22:05) is more in-depth, offering rehearsal and behind-the-scene footage along with interviews by Chow, Kok, and visual effects supervisor Eddy Wong. "Anatomy of a Scene" (6:40) focuses specifically on the shooting of the bathroom stall scene, with Chow, Wong, and Jiao commenting on its marriage of live action and digital character. The stateside Sony staff has whipped up an unusual extra for kids: "How to Bully a Bully: Tips and Tricks for De-Bullifying a Bully" (4:11) is a Saturday-morning-style tutorial on how to cope with bullies, illustrated by clips from the film. "How to Make a Lollipop" (1:29) is also framed as a lesson for kids, but under the narration, it's behind-the-scenes footage of the prop department at work. "CJ7 Profiles" (6:58) offers the video equivalent of baseball cards for the characters of the film, supplemented by clips. The "Theatrical Trailer" (2:10) is included, as are previews for Persepolis, Men in Black, Close Encounters of the Third Kind: 30th Anniversary Ultimate Edition, Spider-Man 3, The Water Horse, Surf's Up, Monster House, Open Season, Married Life, and The Jane Austen Book Club. All site content © 2000-2019 Peter Canavese. Page generated at 04/17/2019 09:00:04PM.